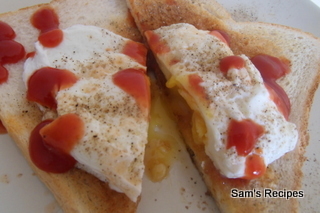 Poached egg is a breakfast classic but I never had the courage to try out myself. That is unless I received this amazing cookery cook called Cookery School with recipes by Richard Corrigan. It teaches how to make poached egg with pictures and the steps seemed quite simple. So I said, onward ahoy! Heat water in a pot. Add a dash of vinegar if the egg is old. This will help to hold the egg white together. Break the egg in a ramekin or a cup. When the water is simmering, stir the water to encourage the egg to swirl around and set compactly. Dunk the egg in the middle of the whirlpool and leave it to cook for a few minutes. Ideally the egg white should be cooked while the yolk should be runny. However, if you like your egg well done, you can leave it in for a few more minutes. Remove the egg with a slotted spoon and drain on a paper or a tea towel before serving.